The Vaporesso SWAG 80W TC Starter Kit is the ultimate compact set in the market, integrating the vaulted OMNI 2.0 Board with sophisticated output settings with 80W of maximum output to pair with the special edition NRG SE Sub-Ohm Tank. The Athena by Geekvape is a really stylish mechanical squonk MOD and RDA kit. The MOD has a magnetic battery door that holds a single 18650 battery within the unit. The battery is not included in the kit, and must be purchased separately. The iJoy ZENITH V3 300W Kit is a futuristic semi-mechanical variable voltage marvel with its exotic design, featuring an IWEPAL Chipset capable of high wattage vaping and a myriad of safety features. The Vaporesso Polar 220W Starter Kit is a modern mod that features the upgraded Omni Board 4.0 chipset, a vibrant 2.0" OLED display, and strikingly futuristic design to pair with the new Cascade Baby SE Tank. 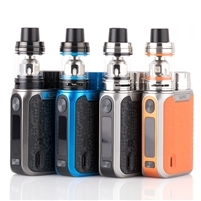 The Aspire Skystar Revvo 210W Touch Screen Starter Kit is built for the modern day era, featuring a timeless chassis design and touch screen functionality of the Skylar 210W Box Mod to pair with the revolutionary Revvo Sub-Ohm Tank. 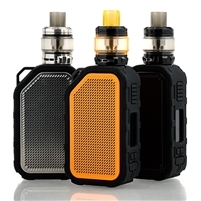 The Vaporesso Revenger X 220W TC Starter Kit retains the illustrious futuristic designs of the original, integrating a responsive touch sensor adjustment buttons with more technological updates with the utilization of the new OMNI Board 2.2.